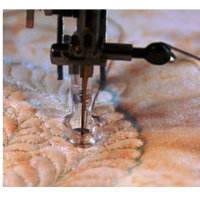 Add perfect circles to your machine-pieced quilts, easily and accuragtely. Combine TLC units, with or without other units, in an infinite number of ways to make 12in circle blocks and 4in curved borders of your own design. Instruction sheet includes 14 blocks and 5 borders.